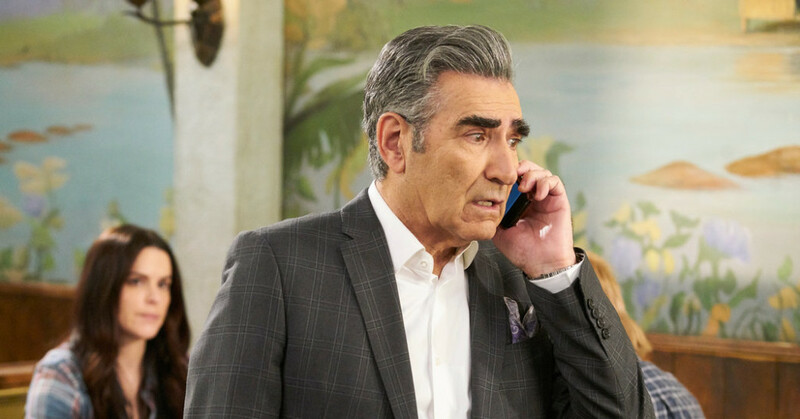 Two episodes herald the fifth season start of “Schitt’s Creek” (Pop, 10 p.m.), the comedy created by Eugene and Dan Levy about a formerly wealthy family now relegated to a small town where they live in a motel. In the new series “Deadly Class” (Syfy, 10 p.m.), Benjamin Wadsworth stars as a homeless teen recruited to join a shoddy academy for assassins, from the graphic novel series by Rick Remender, who helped create it. With Benedict Wong, Lana Condor and Maria Gabriela de Faria. While tonight’s pilot already had a full length preview last month; the official premiere is tonight. “The Dictators Playbook” (PBS, 10 p.m., check local listings) turns its attention to Saddam Hussein. Earlier, “Nature” (PBS, 8 p.m., check local listings) looks at the history of the horse and its long connection to humans. The latest series from the longtime crimefighter and television host is “In Pursuit with John Walsh” (Investigation Discovery, 10 p.m.) in which he looks at cold cases. On some of the far-flung streaming services “A Discovery of Witches” (Sundance, streaming) follows the adventures of a modern day witch. “Wayne” (YouTube Premium, streaming) stars Mark McKenna a 16-year-old taking a dirt bike from Boston to Florida to relieve a stolen Trans Am for his father. His girlfriend, played by Ciara Bravo, tags along on the road trip. On “Modern Family” (ABC, 9 p.m.), Phil and Claire decide to take a cycling tour through Italy. Lainey gets a student a makeover on “Schooled” (ABC, 8:30 p.m.). But “The Goldbergs” (ABC 8 p.m.) are mourning the loss of Lainey from their lives (and the show). On “Chicago Med” (NBC, 8 p.m.), Will adjusts to hospital life. The firehouse decides to enter their dog in a competition on “Chicago Fire” (NBC, 9 p.m.) and a defense attorney is murdered on “Chicago P.D.” (NBC, 10 p.m.). Somehow not part of this series: “Black Ink Crew: Chicago” (VH1, 9 p.m.). A “Mysteries at the Museum” special wonders “Who Killed Billy the Kid?” (Travel, 9 p.m.). Jackie takes “The Real Housewives of New Jersey” (Bravo, 9 p.m.) to a vineyard. Last week, the unmasked Pineapple on “The Masked Singer” (Fox, 9 p.m.) turned out to be Tommy Chong. So who will be revealed tonight? Obviously Cheech. Will’s ex shows up for Sophie’s birthday on “Single Parents” (ABC, 9:30 p.m.). On “Riverdale” (CW, 8 p.m.), Archie is forced to face his demons. Spencer’s team goes to the playoffs on “All American” (CW, 9 p.m.). “Gordon Ramsay’s 24 Hours to Hell & Back” (Fox, 8 p.m.) tries to help an Italian audience in Waterbury, Conn.
On “Family by the Ton” (TLC, 10 p.m.), Casey resents the implication that his morbid obesity is due to video games. You probably don’t even think this is a real show. “Mysteries at the Museum” (Travel, 8 p.m.) goes in pursuit of the motorman of West Virginia. Joel McHale, Jane Krakowski, Finesse Mitchell, Caroline Rhea, Jason Biggs and La Toya Jackson play “Match Game” (ABC, 10 p.m.). A three week series focus on the films of Elia Kazan on Turner Classic Movies wraps up with “East of Eden” (8 p.m.), “Splendor in the Grass” (10:15 p.m.), “Baby Doll” (12:30 a.m.) and “The Arrangement” (2:30 a.m.). Earlier, mad scientists rule all day in the films “The Body Disappears” (6 a.m.), “Dr. Jekyll and Mr. Hyde” (7:15 a.m.), “Hands of a Stranger” (9 a.m.), “The Brain That Wouldn’t Die” (10:30 a.m.), “Indestructible Man” (midnight), “Monkey Business” (1:15 p.m.), “The Killer Shrews” (3 p.m.), “Night of the Lepus” (4:15 p.m.) and “The Haunting” (6 p.m.). Basketball includes Minnesota at Philadelphia (NBA, 7 p.m.) and Chicago at Lakers (NBA, 10:30 p.m.). Hockey has Los Angeles at Minnesota (NBC Sports, 8 p.m.). Men’s college basketball includes Seton Hall at Providence (Fox Sports 1, 6:30 p.m.), Arkansas at Tennessee (ESPN2, 7 p.m.), Kentucky at Georgia (ESPN, 7 p.m.), West Virginia at TCU (ESPNU, 7 p.m.), Southern Illinois at Illinois State (CBS Sports, 7 p.m.), South Florida at Cincinnati (ESPNews, 7 p.m.), Marquette at Georgetown (Fox Sports 1, 8:30 p.m.), Nevada at Boise State (CBS Sports, 9 p.m.), Notre Dame at North Carolina (ESPN, 9 p.m.), Davidson at Saint Joseph’s (ESPNU, 9 p.m.) and New Mexico at San Diego State (CBS Sports, 11 p.m.). In tennis, the Australian Open (Tennis, 7 p.m.; ESPN2, 9 p.m. and 3 a.m.) plays more second round matches. Kelly Ripa and Ryan Seacrest: Howie Mandel, Molly Ringwald, Dolvett Quince. The View: Judd Apatow. The Talk: Jamie Lee Curtis. Ellen DeGeneres: Allison Janney, John Colaneri, Anthony Carrino, Maggie Rogers. Wendy Williams: Robin Lord Taylor, Keri Gassman. The Real: Mona Scott-Young. Stephen Colbert: Jake Gyllenhaal, Pete Holmes, Rebecca Traister. Jimmy Kimmel: Jane Fonda, Lily Tomlin, Stephan James, Sharon Van Etten. Jimmy Fallon: Don Cheadle, Rita Ora. Seth Meyers: Jim Gaffigan, Frankie Shaw, Jason McGerr. James Corden: Cobie Smulders, Sebastian Stan, Joel Kim Booster. Carson Daly: Tom Felton, Jain, Ladygang (rerun). Trevor Noah: Keegan-Michael Key.